Youthful structure with restrained power, but retains elegance. Intense dark fruits supported by fine tannins and spicy oak. 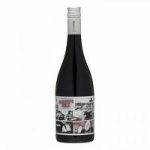 The palate is vibrant and expressive with subtle texture featuring red cherries and boysenberry. Diligent handling of oak exudes savoury notes of slight char combined with delicate cinnamon and nutmeg. A fine, yet balanced acidity line draws together all components leading to a finish that is both structural and complementary.